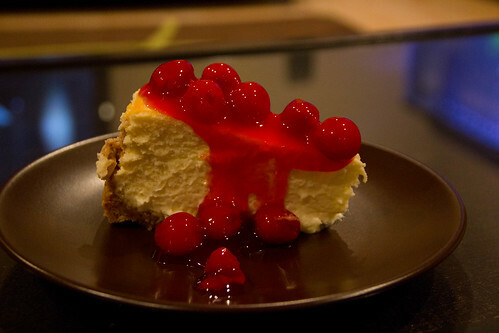 when i first tried my aunt’s cheesecake, it was love at first bite. my aunt and i share the same chocolaty sweet tooth, so it was not a huge surprise that this cheesecake is pure awesomeness. i cannot even begin to describe how perfect this cheesecake is. it has a very unique blend of light fluffiness, but is still very rich. you can top it off with fruit topping, chocolate/caramel syrup and/or whipped cream. or of course, you can eat it plain, because it can definitely hold it’s own! i tried to make a lighter version of the recipe using neufchatel cheese and light sour cream. it doesn’t affect the texture too much. so if you want to feel a little less guilty about indulging in this dessert, i’d definitely recommend the substitutions. the instructions also call for a water bath. the few extra steps are well worth the small bit of effort. your cheesecake will come out crack-less every time! on a side note, i was included in the bellingham herald this week for my spritz cookie recipe… i am honored and couldn’t be more thrilled! here is the article, if you’re interested. preheat oven to 350°. fill a medium sized saucepan with water and heat on stovetop over medium-low heat. the idea is to have it boiling when you put the cheesecake in the oven. adjust heating times/temps accordingly. crush crackers and mix with butter. press on bottom and up sides of a 9-10″ spring form pan. wrap outside of the pan with aluminum foil. make sure that the foil wrap is watertight. 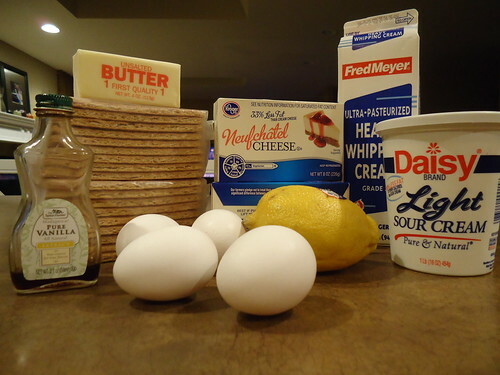 in a stand mixer, mix cream cheese with sugar. add other ingredients, one at a time. mix well after each addition. pour into crust. place cheesecake in a jelly roll pan. pour boiling water from pot into pan. there should be about 1/2″ of water in the pan. bake for 1 hour. then turn the oven off and leave the cake in the oven for another hour. top as desired and then serve. Absolutely hands down the very best family cheesecake. Debbie brought it for Brooke and Dan’s wedding shower and we have loved making,serving, and eating it ever since! A constant dessert success! It’s better than Cheesecake Factory, in my book, and that is saying a lot!